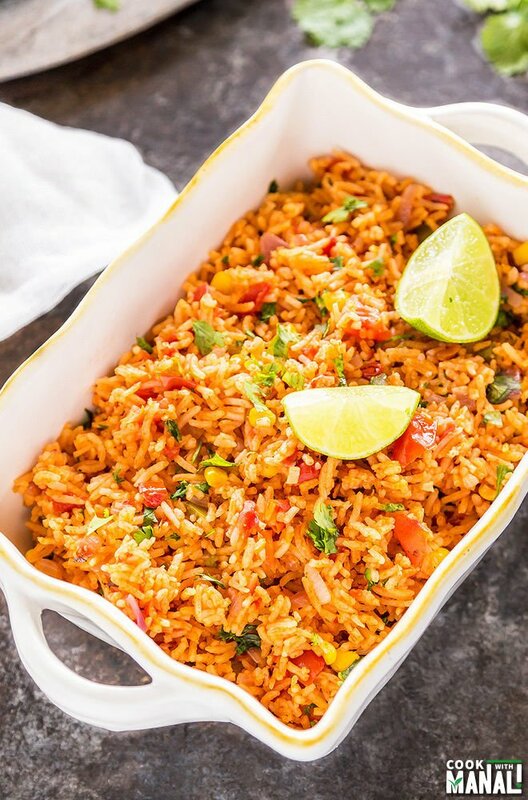 Easy Vegetarian Mexican Rice – serve is as a side or as main dish with tacos, burritos & more. Vegan & gluten-free. 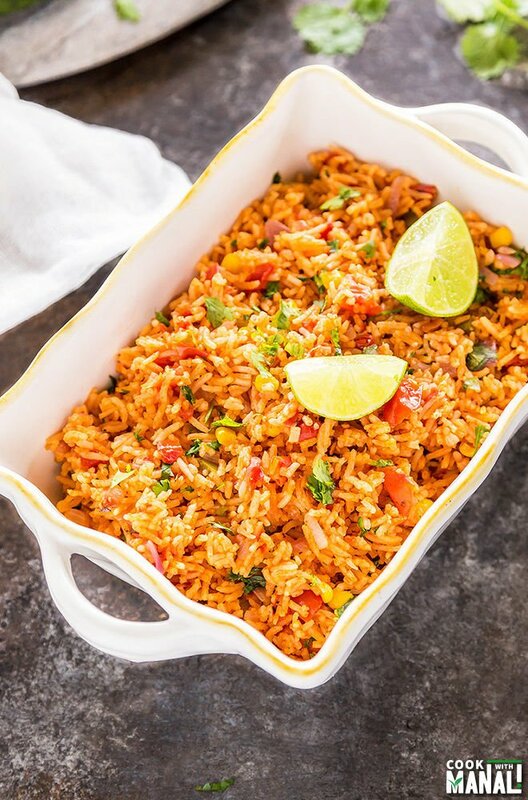 Also check out Instant Pot Mexican Rice! The satisfaction that you get after gorging on your favorite food cannot be described in words, isn’t it? Just the day before I went out to eat my favorite chaat (Indian street food) and had plate full of aloo tikki, golgappe, samosa chaat. Ahh, sheer bliss! No matter how much you make all this at home, the taste of chaat when you eat directly from the roadside carts in India is just something else. Somehow eating golgappe in a fancy restaurant or at your home never feels the same to me. I think that’s typical Indian chaat lover in me speaking. Anyway that day it was really cold and I had some throat pain too but I braved it all for my favorite chaat. I was like even if I get throat infection, it will be worth it. Yes, anything for that delicious chaat in cold Delhi winters. Talking about my favorite food, Mexican food is also right up there. Mexican food is probably my favorite after Indian, oh well there’s Italian too. I mean it’s tough to decide which one is my most favorite but it is one of my favorites. I love mexican flavors and I also love the fact that they have so many vegetarian options. Remember when I posted the stuffed poblano peppers? 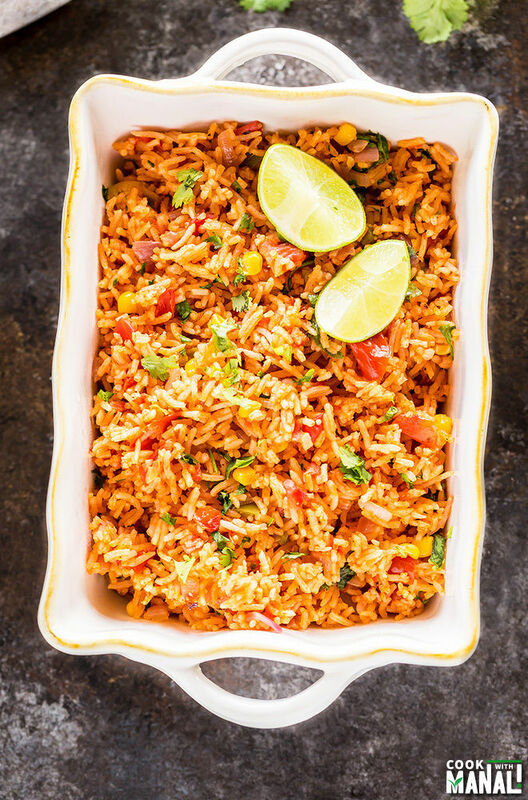 I served those with vegetarian mexican rice and I finally get around to sharing the recipe. Okay thinking about it is making my mouth water since I haven’t had mexican food in more than 2 months now! I remember the very first time I had mexican rice, which wasn’t too long back and instantly loved it. Since then, I have had mexican rice in so many places and while everyone makes them differently, they all have the basic flavors. 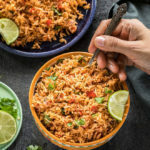 The restaurant style mexican rice is not difficult to cook at home, in fact it’s quite easy to make with a handful on ingredients. Here’s the Instant Pot version of this recipe! *Rinse and soak rice in enough water for 15-20 minutes. Drain and set aside. Then add crushed tomatoes, vegetable broth or water and mix. Lower the heat to medium. Cover the pan and cook for 10 minutes. After 10 minutes, lower heat to low and cover and cook for another 5-10 minutes or till rice is soft and done. Switch off flame and let the rice remain covered. Remove cover after 10-15 minutes. 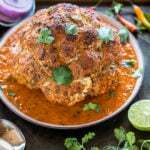 Fluff with fork, add cilantro and lime juice. 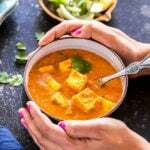 * The amount of vegetable broth/water that you use in the recipe may change depending on the type of rice you use. 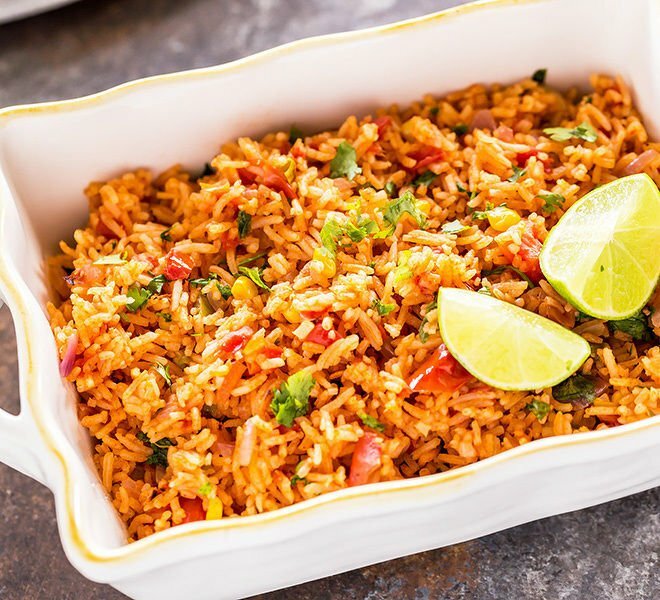 * To increase the heat and make the rice more spicy – use more jalapeno peppers or use some cayenne pepper. * You can add peas, black beans, carrots as well to the rice. 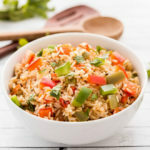 Mexican rice is one of my favorite side dishes! This vegetarian version looks wonderful, Manali! 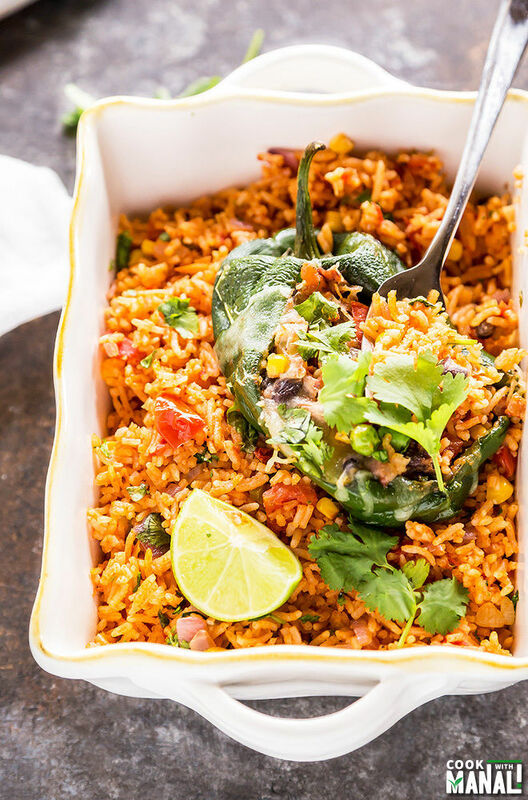 I love spicy Mexican rice – there have been days lately when we go to Mexican restaurants and all I order is side of Mexican rice! 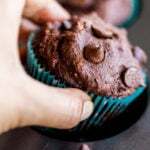 Your version looks yum Manali!! And I saw your chaat video on Insta and I suddenly wished I was in India eating all that street chaat!! Thanks Ami! Indian chaat is the best, isn’t it? This can be my favourite too. Simple yet so good! To be honest never tried Mexican.. I know sounds weird right!!! But this post has tempted me to try it.. will be trying soon..
oh you are missing out Sushma! Mexican flavors are wonderful you will love it! 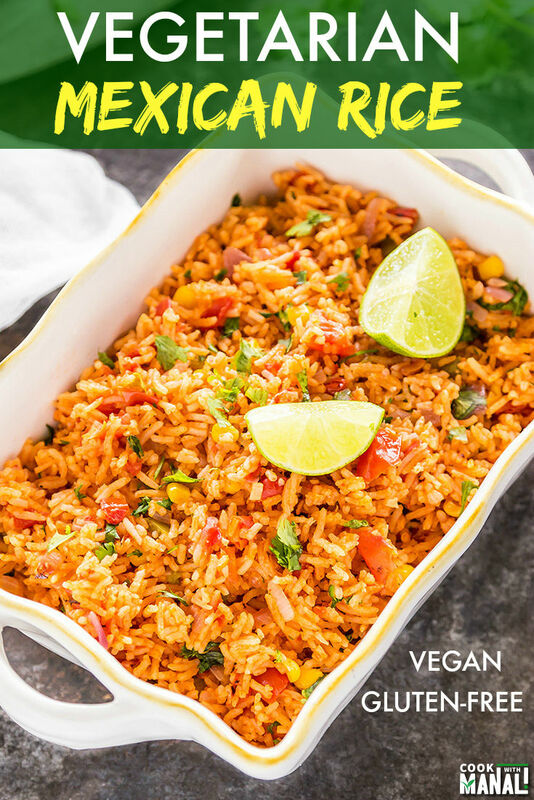 I loooove a good Mexican rice and I’m dying over how amazing this vegetarian version looks, Manali! This would be such a good side dish to tacos! Manali, your aloo paratha are well appreciated. I love vegetarian rice but never tried vegetarian mexican rice till now. 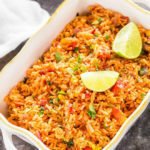 This Mexican Rice is so delicious and healthy! I am allergic to Cayenne so I just add more Cumin and more Jalapeno. So good! I have made it 4 times in the last two months! YUM! Family and younger kids loved it too! 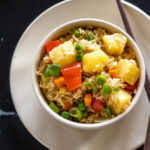 This looks yummy, but how much water do you add to the rice? Hi Garima, amount of water would depend on the type of rice you use. I have used basmati rice here and as I have mentioned in the recipe, I have used 1.5 cups of vegetable broth of water and 1 cup crushed tomatoes. hope this helps! We can add t spoon full of taco seasoning while boiling Basmati Rice. And then follow Manali’s recepie. I tried and that turned out great !! Great suggestion Rupal, thanks for the tip! This was great. I put a lot more cilantro in it, whole stalks. Thank you! Always extra cilantro! 😉 you are welcome! 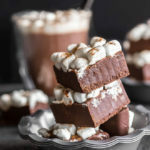 I was scrolling throug twitter when this recipe appeared. Sounds really interesting! To be honest is not the rice that I’m used to eat, but Mexican food is very versatile. Also saw that you are preparing a Indian cookbook!!! Congratulations, I definitly will order a copy! hmm I recommend canned tomatoes for this recipe..however if you still want to use fresh, I would use 2-3 large tomatoes and puree them before using. 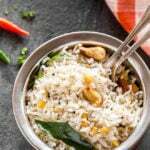 Can brown rice be used? Glad it worked and you enjoyed it!